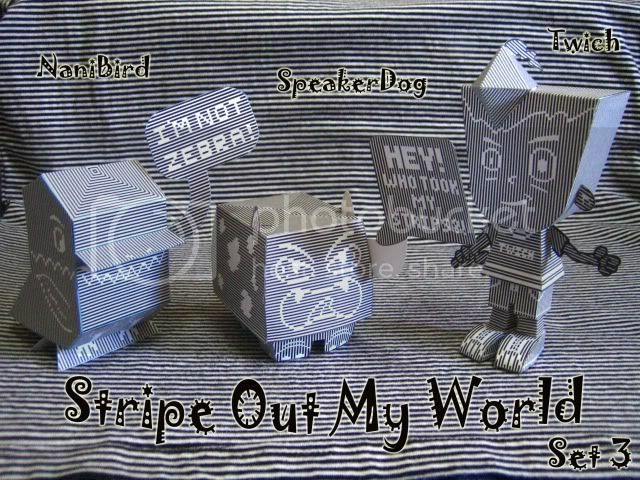 Speakerdog Paper Toys Series 6! This time, I used models from NaniBird, SpeakerDog and Twich. But this months computer arts special is a "character Design" issue. so i'll give a toot for them. Me and Luke 'Glood' Have made a toy today (it was mostly Luke but I helped a little. Hre it is. Meet the Attabot T-1000, our submission for the monkeyinadryer competition. Template and a stormtrooper in action can be found on microdot.be..
ive decided on a prize and a competition now i just need to get everything ready to get a head start and be part and help decide other prizes join the sock dog competition group. Those of you wanting to be in the cutzilla series there is only 4 spaces left ( 1 if you count the people who have said they will do one but havn't yet) I already have too great designs from Alexander Gwynne and Ross. hay im thinking of doing a competition but im not sure what to do as a prize any ideas? Cubeecraft Consoles (Dreamcast, NES) now available. Likely more coming.